It's almost impossible to sort through all the options available and what differences exist. 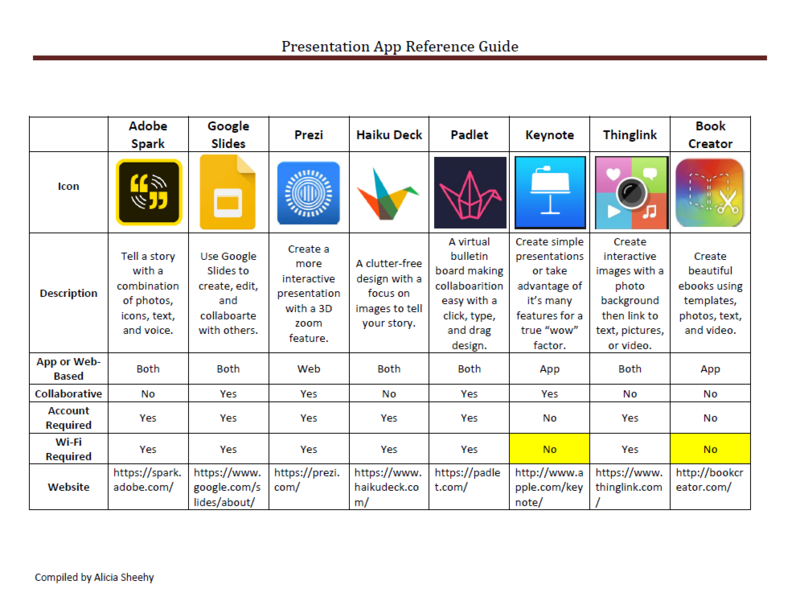 So, (drumroll please) check out the handy Presentation App Reference Guide I compiled focusing on apps specific to my district. 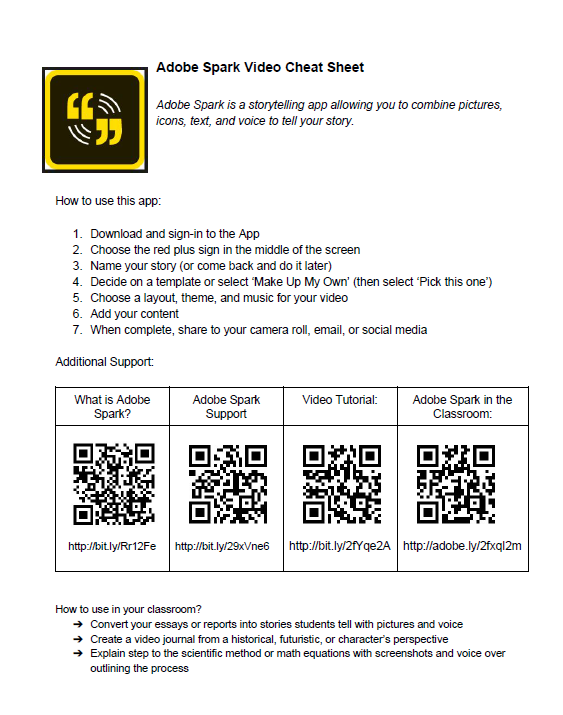 I'm hoping this is a handy tool that teachers and students can use to choose the app that is best for their content, purpose, wi-fi availability, and collaboration needs. Note: I selected the yes/no descriptors below that are most user-friendly. I realize there may be exceptions or "ways around" some of these things (such as being able to view Prezi in an app) but for the purpose of this reference guide I did not want to over-complicate things. My favorite lesson to teach is, hands down, Stop Motion Films. I love the creativity that comes alive in these assignments. I love the student ownership. I love the collaborative environment. There's something special about taking a step back, looking around, and watching creativity happen. Though there are a number of resources out there to use when creating Stop Motion Films I couldn't find one that worked for me so, as I often do, I created a lesson plan that I believed best fit my student's needs. Day 1: Introduce Stop Motion Films. When I excitedly tell students, "YOU are going to be creating Stop Motion Films!" they look at me like I'm a little crazy. They really don't know what I am talking about let alone how they are going to do it. So, we start with looking at a number of Stop Motion Film examples. I start with the professional ones because this is something many students have often seen but didn't realize this type of creation had a name. I usually show clips from The Box Trolls, Gumby, Wallace and Grommit, and Rudolph. Next we look at Stop Motion Films created by "real people." I have a list of videos I found on YouTube I like to show. Though I don't think it matters what videos you show I believe the key is showing a number of different mediums being used. I show videos created with Legos, candy, barbies, paper, playdoh, and more. This is the exciting part when the lightbulbs start to go off. This is where students start to make connections and become invested in what they are about to do.We end with a few short "how-to" videos on Stop Motion Films. On day 2 students sit with the groups they will be working and begin to work on their Planning Guide. Groups of 3 seem to be the best number as everyone has an important role to play and no one seems to slip under the cracks as far as helping to create the film. Students are introduced to the planning guide and students have the rest of the class period to brainstorm and make decisions. It is especially important that all ideas are written down and at least discussed briefly. I do remind students that if you think it would be great to do a movie made from Starbursts but you don't have, or can't get, Starburst be sure to mention that early on. We don't want to invest all of our energy in something that isn't attainable-yet. My planning guide is pictured below and features all of the elements I want my students to decide eon early on in the process. The Planning Guide must be complete before students move on to the Day 3 activity. Day 3 is spent defining, looking at, and creating a Storyboard for the movie. When creating the Storyboard I encourage students to first draw and then describe the beginning, middle, and end of their film. From there they will work together to figure out the small steps along the way, or how their film will progress from beginning to end. Though students are not locked into their Storyboard a complete Storyboard helps the filming process take place in a much smoother process. To create our Stop Motion Film we use the app Stop Motion Studio Pro. I looked at a lot of apps and this one was, in my opinion, the most user friendly with the best options. Filming takes most groups two to three days however depending on how in-depth and organized each group is it may take some groups more or less time. I do set the 3rd day as a soft deadline for finishing up all photos. I set my class requirement to 100 pictures minimum. This seems to be a good number for students to create a nice short film with some details and plot line. Groups are often overwhelmed with the number at first however many go far past it. The final step to the film is editing. Most groups are able to get this done in one class period or less as it is relatively straight forward and many do some editing as they go. Students just follow the steps below (in theory) to choose all of their editing options. The final step in creating their Stop Motion Films is to evaluate themselves and their partners. Students evaluate following the guideline "2 Pluses and 1 Wish." Students list their name first and then everyone else in their group. Afterwards, students write down two things that went well (pluses) and I change they would make or wish their partner would have made (wish). This setup allows me to see something all students did well in addition to seeing concerns group members may have. Even the best videos and creators would do something different the second time around so I believe this format provides a reflection for all of my students. About a week after the movies are finished and I have had time to grade them and upload all the videos to YouTube we celebrate our successes with a Film Festival. Students bring snacks and drinks and we sit back and enjoy watching each other's films. Though I don't require anything formal on this celebration day students often shout out words of encouragement and wonder about each other's movies. It is an exciting time as students get to celebrate their success as a film producer. And it's a great time for me as well. Nothing quite compares to sitting back and taking in the wonder of watching your students create, shine, and excel at something that just a week ago they didn't even know existed. Ugh... I just groan thinking about what I did last year. Get a piece of paper. Write down the word and the definition. Put it away and DO NOT lose it. Study before the final test. No reflection. No connection. No technology. Pretty lame for a digital literacy teacher. Thankfully, I decided to step it up a notch this year. To start, I created a template in Keynote including all the main aspects I wanted covered in student's vocabulary notebooks. I sent students the template using Air Drop and after creating a Cover and Index Page, students added the templates to their books. At the end of the unit, students will take the time to reflect on the learning that took place and add a picture or video related to the topic. The photo or video chosen is completely up to the student and serves as a way to create connections amongst students, the word, and the lesson. Making this change has had a positive impact in my classroom as students are completing vocabulary activities with a purpose. It is especially exciting to see how each students photo and reflection is unique to their own personality and creates a connection beyond learning a definition. Moving forward, students will create a cover page highlighting their learning throughout the class, update their index to reflect their book, and create their own page templates unique to them. Kahoot, Memes, and Expectations. Oh My! Those dreaded expectations. They're important to address, review, and discuss but there's not a fun way to do it. Until now! I decided to revamp going over class expectations with the help of Kahoot and memes. I created a Kahoot with questions about all my expectations and added funny memes to reinforce each expectation. Students played Kahoot with little knowledge about my classroom expectations and had to use common sense, critical thinking, and memes to help them choose the answer that was most appropriate. After each answer appeared I briefly discussed each expectation and cleared up any confusion. By providing wrong answer choices that seemed logical (to the students) I was also able to address those ever popular "what not to do scenarios." Not only did the students have fun, learn a lot, and beg for more, I now have an already-created way to address expectations in the future. If changes come up I can simply edit my game and review with my students as needed. ﻿And that, my friends, is why I'm here. I am excited to share my journey with you as I work to integrate technology into my middle school classroom, curriculum, and school presence. This year is a big year for our district as 1:1 iPads have been rolled out and Schoology will be used as our district-wide Learning Management System. I am very excited and eager to see what those changes will bring for our students, staff, and school. I will be teaching four different classes this year; 6th grade Language Arts, 7th and 8th grade Digital Literacy, as well as a mixed-grade Study Skills class. My goal is to use Schoology, iPads, portfolios, and gamification as active elements in some or all parts of those classes. My goal is to share with you the real-world happenings that take place in my class as I work to integrate technology in a way that well help my students grow, succeed, and share their learning with the world. I hope that what I have learned, the resources I have found, and the experiences from my own classroom will help you to integrate technology in ways that work best for you.